Review: "Climax Blues: Broke Heart Blues" - Sea of Tranquility - The Web Destination for Progressive Music! The world lost a classy, true talent on October 30, 2013, when Pete Haycock, founding member, lead guitarist & vocalist of the Climax Blues Band, passed away suddenly of a heart attack at the young age of 62. Just prior, along with well travelled guitarist/singer Robin George, King Crimson alumni Mel Collins (saxophone), drummer Charlie Morgan, bassist Charley Charlesworth, and vocalist Jacquie Williams, a new band was formed, simply titled Climax Blues, and their debut album Broke Heart Blues completed for Angel Air Records. Sadly, due to Haycock's death, this will be their first and only release, but it's a good one, an album filled with gritty blues rock, pop, and a lot of soul. Having three lead vocalists here really adds a nice dimension to the album, giving each song plenty of variety and flavors. "Gossip is Gold" is permeated by Williams' lovely vocals, supported by some rampaging guitar licks from Haycock & George as well as Collins' searing sax explorations. "Blue Monday" and "Cruel" are two of the harder rockers in the set, each chock full of tasty guitar work, and "Miss You So" is a funky blues rocker with no shortage of catchy hooks. The George penned "The Rubicon" offers up heavier riffs and layers of superb vocal melodies from all three singers, Collins sneaking in some jazzy sax lines in spots to add a majestic touch, while "Lonely Avenue" sees the band drop into a bluesy boogie shuffle. Other highlights include the laid back blues/jazz of "Bluesong", the raunchy title track, the irresistible "I Feel So Blue", and the scorching slide guitar workout that is "You Ain't Got the Right". When Broke Heart Blues works, it's an album that is really on point, delivering memorable melodies, wonderful guitar work, catchy rhythms, and the always classic presence of Mel Collins. On another hand, it does suffer from perhaps too many songs (10 would have been perfect here), as the listener can start to get a little fatigued three quarters of the way through, but the good clearly outweighs the lackluster. It's just still so sad that Pete Haycock is no longer with us, but he's left behind a monumental body of work with Climax Blues Band as well as this enjoyable little album. Given the sad passing of Pete Haycock of the Climax Blues Band (and a notable solo career) just prior to the completion of this first Climax Blues album, its title, Broke Heart Blues, couldn't be more apt. Always more of a well kept secret than his fiery, fluid, yet subtle guitar work deserved, Haycock really was one of the UK's best exponents of this style and alongside guitarist, singer, songwriter Robin George (whose collaborations with big names would fill this review on their own...) he has created an album which demonstrates exactly why. Unsurprisingly the style is blues based, yet things certainly rock up from time to time, while a soulful delivery throughout is what binds it all together. Having contributed to the song writing to some extent on all of the tracks, it is to George's credit that he is as happy taking a back seat to Haycock on this album even when he is stepping up to the mic, or to the stage front for a guitar solo. However Haycock's work on "Cruel", "Broke Hearted Blues" and "Got To Get It Right" (an excellent riposte to the Climax Blues Band's "Couldn't Get It Right") is sublime, the space he's allowed filled beautifully, but not over exuberantly, each and every time. The cast surrounding the pair is equally impressive, regular George collaborators Charley Charlesworth (bass) and Charlie Morgan (drums) nailing everything down with an easy authority, while vocalist Jacquie Williams is the perfect foil for Haycock and George's voices. In fact, having the three singers alternate and intertwine is an inspired move, varying the focus and altering the attack of the songs as they pass by. All three are on top form, and when Haycock roughs things up on the chorus and George and Williams smooth it on the verse of "Miss You So", the results are quite spectacular. Factor in saxophone punctuations from the ever excellent Mel Collins and BHB becomes an album willing to caress, cajole and when the need arises, impose upon the senses in the most seductive of ways. "Bluesong" proves a real favourite, the tongue in cheek listing of what is needed lyrically to create a 'blues song' delivered with the care and love only those steeped in the blues ever could and the acoustic bonus version is a beautiful album closer. 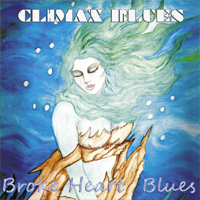 It's undoubtedly a tragedy that Broke Heart Blues will be the only album released by Climax Blues. However it is a fitting tribute to a musician and person taken from us too early. More importantly it's an album which on its own merits finds a group of musicians firing on all six and creating a set of songs to enjoy and engage with for many years to come.